Located in Old Bend Oxford Hotel Bend is a perfect starting point from which to explore Bend (OR). Featuring a satisfying list of amenities guests will find their stay at the property a comfortable one. 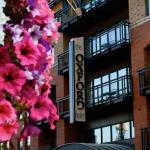 Service-minded staff will welcome and guide you at Oxford Hotel Bend. Flat screen television whirlpool bathtub air conditioning heating desk can be found in selected guestrooms. The property offers various recreational opportunities. Oxford Hotel Bend combines warm hospitality with a lovely ambiance to make your stay in Bend (OR) unforgettable.